For Christmas, Marni and I were giddy with excitement when we received twin Mini Cocottes from our mom. While my cadmium red duo looks absolutely adorable positioned on my kitchen window sill, I instantly started brainstorming how to use the vessels in cooking as well. Do I go sweet or savory? Hot or cold? Breakfast or dinner? Whenever I am perplexed, I think back to my travels for inspiration. While living in Spain for the first time in college, I lived with a host family that introduced me to classic Central Spanish cuisine. One of my favorite dishes was my Señora’s pisto. It’s a Spanish take on ratatouille with a thick, tomato-based sauce mixed with stewed vegetables. Pisto is commonly served either over a bed of white rice or with an egg cracked on top and baked. To mix up my morning routine, I spooned the pisto with some spicy chorizo sausage into my mini cocottes, cracked an egg on top of each one, and covered the bubbling beauties with Manchego cheese. On medium-high, heat the EVOO in a large skillet. Add the chorizo and brown for 2 to 3 minutes. Next add the garlic, onion, zucchini and sautee for an additional 5 minutes until tender. Add the tomatoes, tomato sauce, roasted red peppers, water and vinegar and stir to combine. Reduce the temperature to low and simmer for 20 minutes. If the sauce is too thick, add a little more water. Stir in the salt and pepper to taste. While the pisto is stewing, preheat the oven to 400 degrees Fahrenheit. Spoon about 1/4 of the pisto mixture into each mini cocotte. Using the back of a spoon, create a well in the middle of each cocotte. Crack an egg and carefully drop the raw egg into the center of the hole. Sprinkle with salt, pepper and Manchego cheese. Repeat with remaining 3 cocottes. Cook for 15 minutes or until the whites of the eggs are set and opaque. The yolk will remain somewhat runny. Sprinkle with flat leaf parsley and serve. Serves 4. This recipe can also be prepared in one large skillet and spooned out. 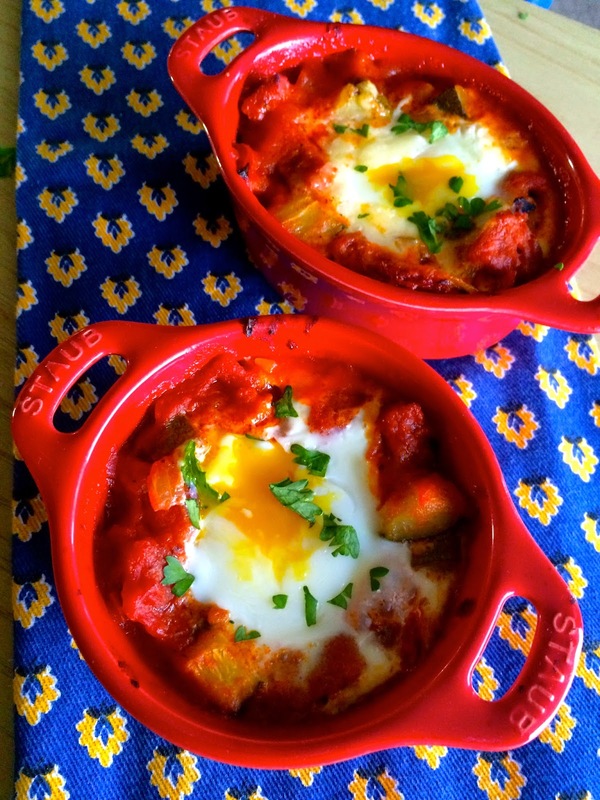 I enjoyed the baked eggs for breakfast but they could definitely be served for any meal!